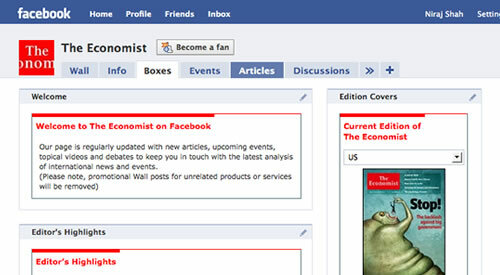 In order to promote The Economist Fan Page, I build a set of applications to engage users and update them with the latest Economist content. I create a set of widgets that live on the “Boxes” tab of the Fan Page. The widgets include a Welcome Message, Editor’s Highlight, and a Search box. The Editor’s Highlight and Features widget uses RSS feeds to pull in real-time content from the Economist website. The search widget lets users search for articles on the Economist website. The Covers widget shows the latest issue of Economist in the US, UK, Europe and Asia. I also built a custom tab called “Articles“, which include a larger version of the widgets on the Boxes tab. These again use RSS to pull in real-time content from The Economist. A excerpt of the articles are shown on the tab, with a link to the full article on The Economist. The user can also share the articles straight to their newsfeed. Visit the Economist Fan Page.